I’ve abandoned another project. That is to say, the Idea Fairy has won this round: I’ve shelved the game I’ve been working on for the last few months and begun something new. While I’m excited about my new game (and why wouldn’t I be? I’ve only been working on it for three days), I figured it’s worth taking some time to figure out what happened to Strange Gravity, and why it’s back on the shelf again. A large part of this is due to a demo night here in Boston that I took my working build to. And that’s not to say that the evening even went badly. Here’s what happened. I’d taken things I’d learned from watching people play the original 7DFPS build and revamped many features, including the logic behind how spores are generated, transferred, and destroyed (which is quite a lot of the gameplay). My improved logic was considerably faster and more efficient. Also improved was the tutorial, which I saw many people just skip in the original game. I made out much shorter, which was a good thing. I still counted on people walking up and reading placards I’d set up, which was not a good thing. Also not a great idea: setting the tutorial on a flying disc above the ocean with no invisible walls or logic to handle falling INTO the ocean. In my tests, of course, I’d never fallen off the platform once. This didn’t stop a good 40% of players at the demo night tumbling helplessly into a low-poly abyss just moments after the game began. Aside from that, though, I learned that I hadn’t actually improved the tutorial at all. People had just as much trouble following the 5 simple instructions I’d put on the sign as they’d had meandering through my museum tutorial from the original version. Now, I’m assuming that I didn’t randomly get a sampling of players incapable of playing through any given tutorial, so the fault was clearly on my end. I’m currently chalking it up to confusing layout, overly-small instructional text that wasn’t drawn directly on the screen, not incorporating learning better into the actual gameplay, and the fact that I was doing a multiplayer-only demo (tutorials work better for single players, I guess). That being said, I still don’t know how to make a tutorial WELL, especially for a game that has some relatively complex mechanics. I guess I should go back and play some old favorite games, and NOT skip the tutorials because I already know how to play them. If you know any games that have excellent multiplayer tutorials, particularly first-person games, please let me know on Twitter. It doesn’t work SUPER well. Especially in multiplayer. The battles quickly became very hectic, with swirling cameras and little player awareness of what was going on. I can think of a few reasons why this might be, including poorly-thought-out level design and the very small screen that I was testing on, but it was discouraging nonetheless. It’s Not About the Aliens screenshot. This came from the awesome David Cherepov, who played, enjoyed, and gave me tons of great feedback for my favorite game that I’ve developed, It’s Not About the Aliens. This comment, as well as my other experiences at the demo night, brought me to an important conclusion: I’m not making the type of game that I really want to play. I mean, sure, if Strange Gravity were a completed game, with a fully fleshed-out story mode and a multiplayer mode, I would play it and enjoy it. I would not, however, play the multiplayer mode. I don’t really like multiplayer. I was mostly working on implementing this feature because I felt like it would fit for the game style, not because I thought it sounded fun. Thus, a large chunk of my recent developer energy went into a part of the game that I wasn’t super interested in. One of my main goals was still accomplished, though, which was learning how to do more stuff. I learned tons of stuff I didn’t know, and that’s half of why I do what I do. The other half, of course, is ending up with a finished product, which was not the case here. At present, though, I’ve begun work on something that I actually DO want to play (a story-driven, 2D platformer), and I think that’s serving me well for the time being. 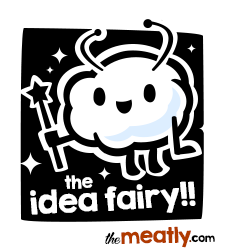 Have you ever lost a battle with the Idea Fairy? What happened to that old project?